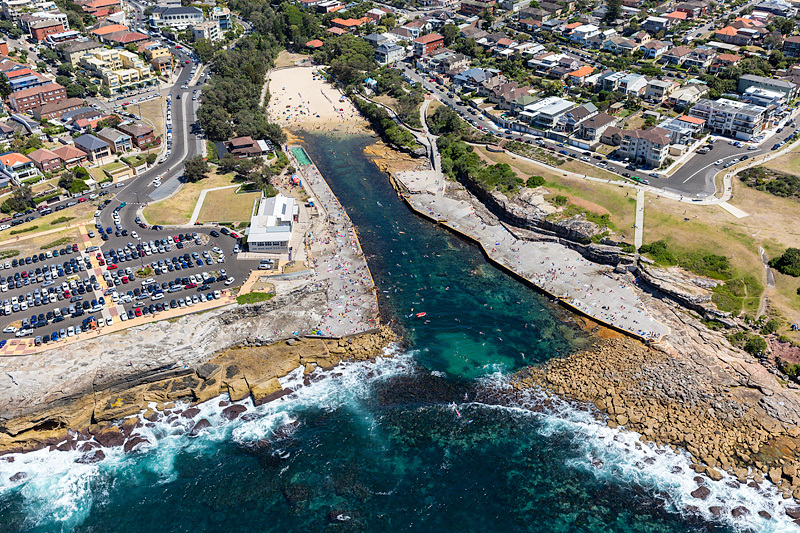 Welcome to the Bondi to Coogee Walk info page that I have put together for you, using the stunning aerial images from my gallery. This page will have everything for you to get the most from the walk. About the walk, the beaches, public toilets, swimming safety, local resource links. So bookmark, Share, Facebook Like do what you need to so you can access this page when you need it. 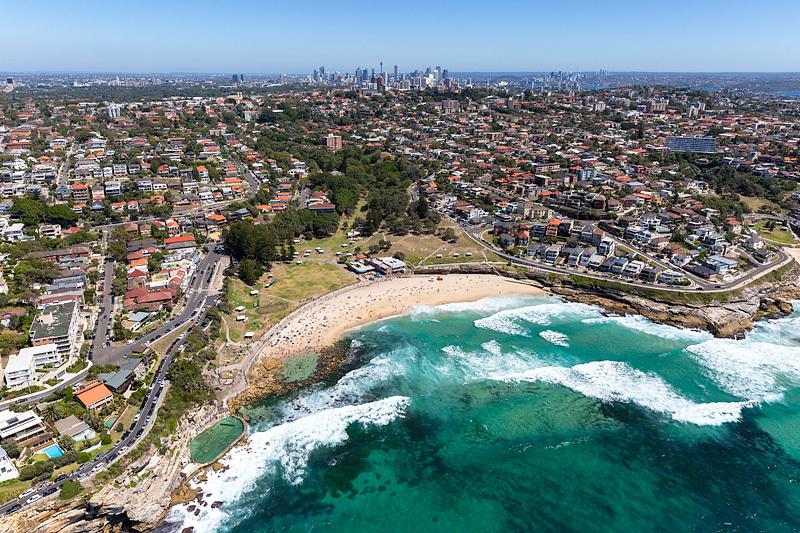 The Bondi to Coogee Walk is a popular walk in Sydney that hundreds of thousands of locals and tourist undertake each year. 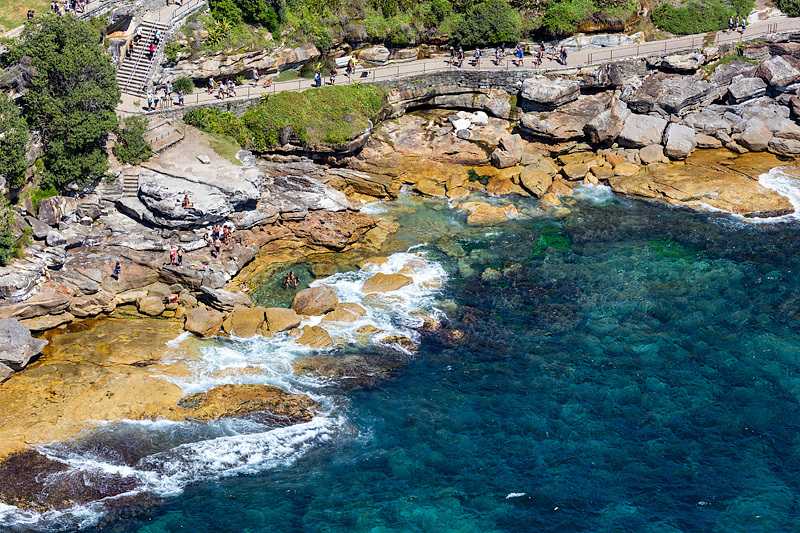 The walk is approx six kilometers in length (will take you about 2 hours to do without pushing yourself) and is a stunning visual feast along the path ways that line the sandstone cliffs of Sydney’s Eastern Beaches. 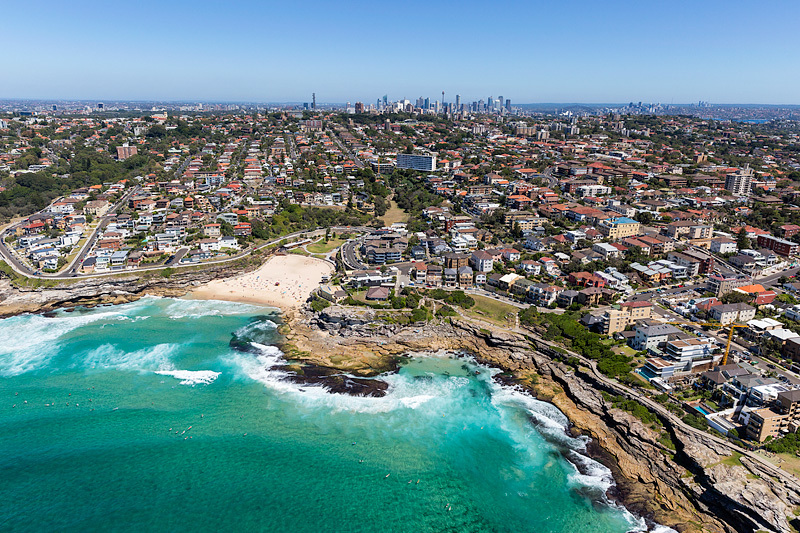 The walk starts at the famous Bondi Beach and as you make your way to Coogee you will first come to Mackenzies Bay which is just before Tamarama (or Glamarama as locals call it) and you will soon see why. 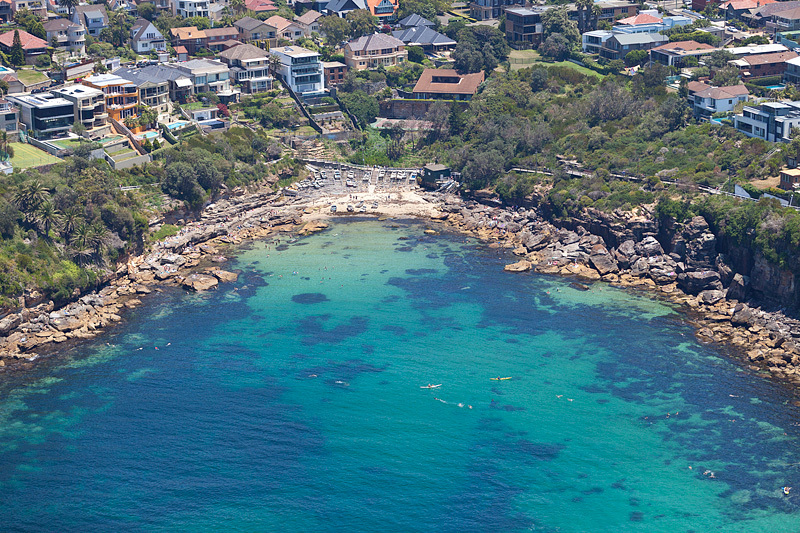 From Tamarama you snake around to beautiful Bronte Beach, then Gordons Bay and Clovelly. 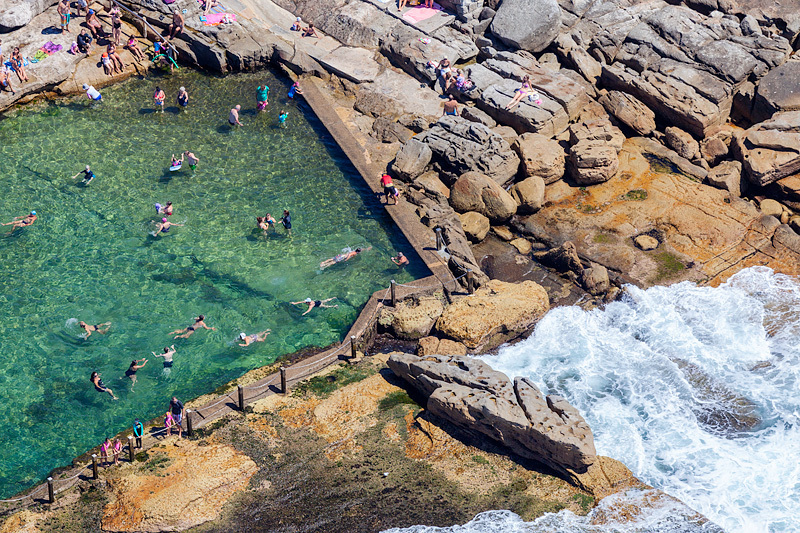 Clovelly is a very unique swimming location in Sydney where the actual beach is about 20 meters wide but lined to the left and right is a concrete beach that is about 200 meters long. As you pull up to Coogee your welcomed by another stunning beach similar to Bondi but without the crowds. 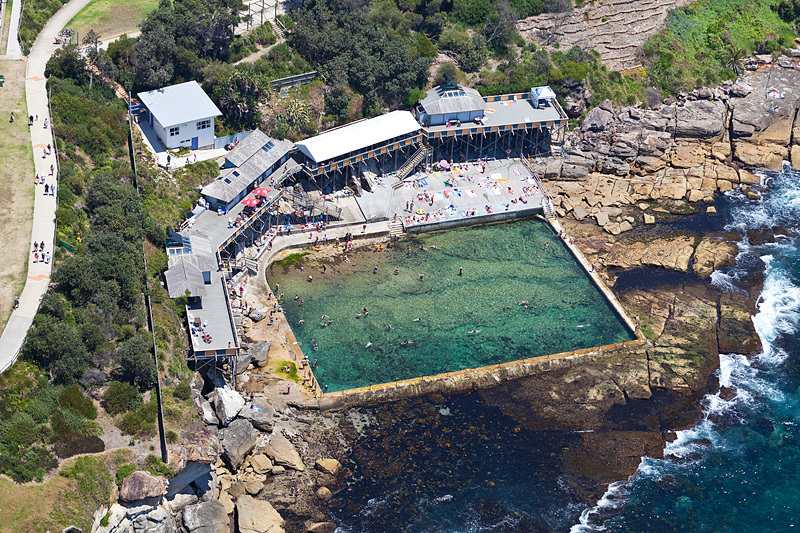 The ocean baths at Coogee’s south end are just as unique as all the others and well worth a visit. If your keen to continue another solid hours walk will take you to Maroubra but on the way you will pass Wylie Baths just up from Coogee. You don’t need a helicopter to take great photos along your walk. 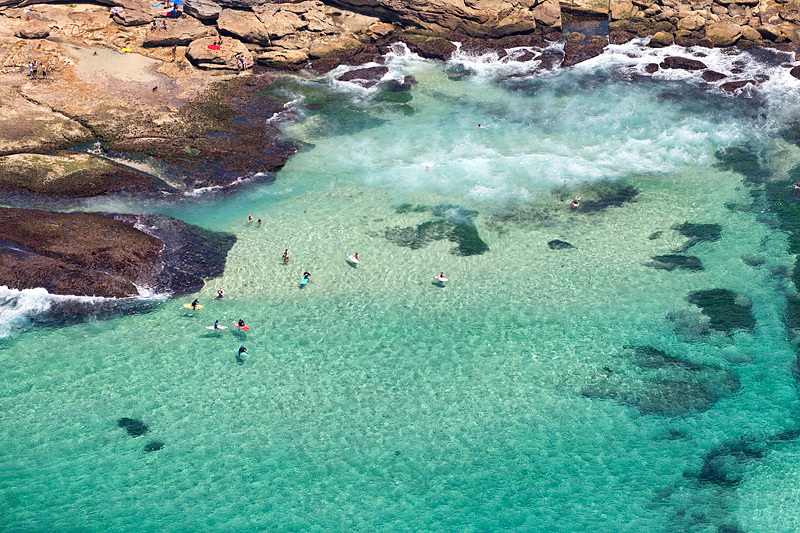 With the sandstone headlands you pretty much have a birds eye view down on all the beaches and you will see the amazing colours of the ocean just like my aerial images. Quite often along the walk you have other opportunities present themselves as well from surfer and also dolphins swimming in and out of the breaks. Easy to shoot with a longer lens like 200 to 400mm. If taking day time photos a good camera capture setting is to put your camera in Manual mode, your iso on 100, your aperture on F11 and a shutter speed of 1/125th of a sec to 1/160 of a second. 90% of the time this will give you great shots. For those not confident in shooting manual you can still put your camera on 100 iso and F11 but shoot in Aperture Priority mode. Also don’t forget your polariser as well, it can work wonders on the water, if your going to put your polariser on just remember it will reduce your shutter speed by at least 100% so remember to compensate that in your exposure if shooting manual. If shooting in Aperture Priority just increase your ISO to 200 and you will be fine. On this walk if your taking photos you won’t need your tripod when your day time shooting your shutter speeds are fast enough so you won’t need it. I have listed all the beaches you will see along the way below. In most of them you can see the walking track. 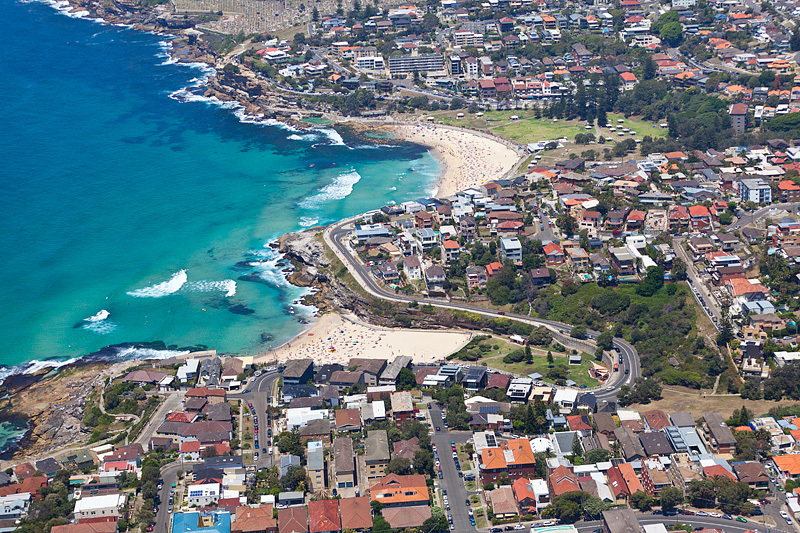 Their all aerial images that you can find in the main gallery on my website under Eastern Beaches, Sydney. 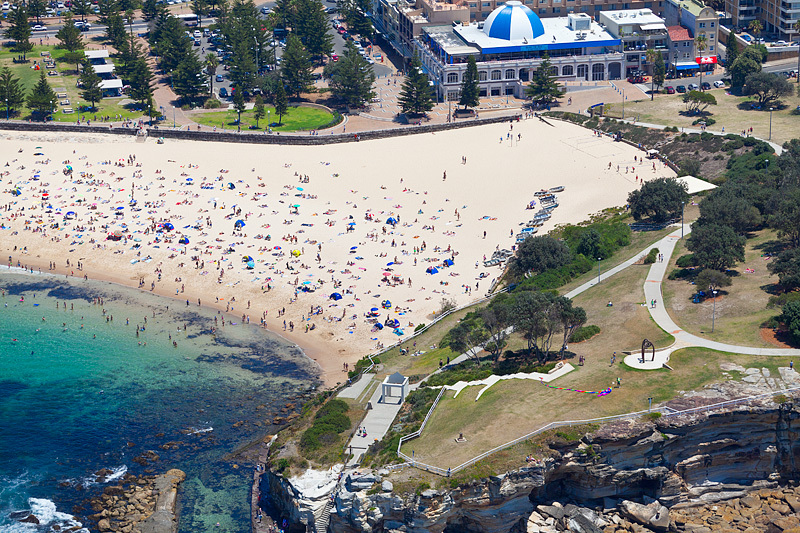 The Bondi to Coogee Walk is also home to the yearly Sculpture By The Sea, the world’s largest annual free-to-the-public outdoor sculpture exhibition that displays an amazing amount of unique outdoor art along the coastline. Brings in hundreds and thousands of visitors every year and it is a must do if you haven’t done it before. If you don’t like crowds then I suggest getting there early when numbers are low. 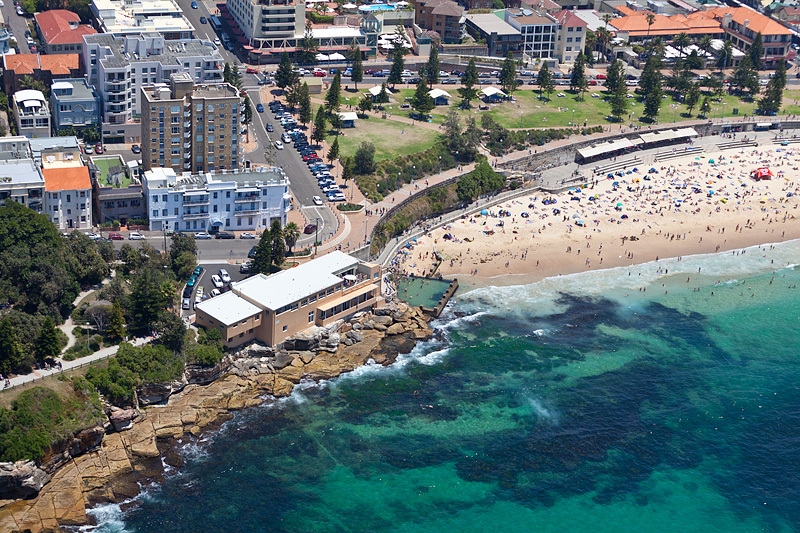 The event is along the Bondi to Tamarama section of the walk. 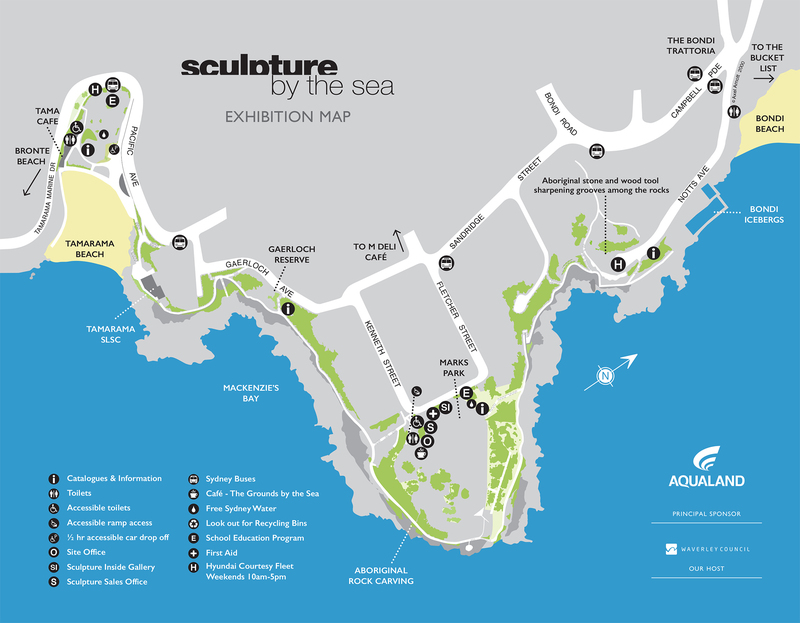 For further information this is the official Sculpture by the Sea website that will have the new dates and details. Be safe if you decide to swim in the ocean, all the beaches look very inviting but most of the beaches will have a RIP that can be fatal if you get caught in one and can’t get out of it. A lot of first time visitors to Australia who have little or no experience swimming in the ocean can find them selves in this dangerous situation. I recommend you read this article on Rip Currents to give yourself some awareness about them. Below is just one of the informative videos they have on their website. Here are a list of resource links so you can find out further details about what might be happening along the walk, especially on the Surf Life Saving Clubs. Depending on when your doing the walk summer or winter can determine if a beach is patrolled by lifesavers. 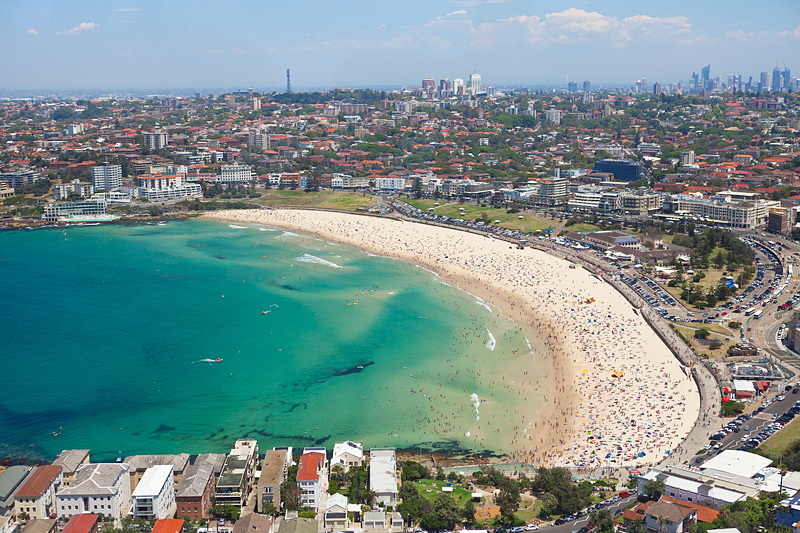 A list of other events held along Sydney’s Eastern Beaches during the year. Found on the Sydney.com website. This entry was posted in Photo Guides. Bookmark the permalink.